Bolts and straps to rear of our PaddleSkis. Holds up to 85 lbs. thrust electric engine - sorry, not for gas engines! Made with coated marine plywood with aluminum & stainless steel components. A nice feature of this design is that the weight of the battery on the starboard side balances the motor on the port side. Battery box not included. 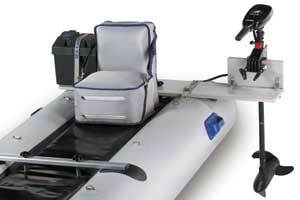 Shown with deluxe fly fishing high seat also not included.